The morning dawned cold and cloudy, but by the afternoon sun broke through the gray sky and warmed the air near the beach to a good 55 degrees or so. 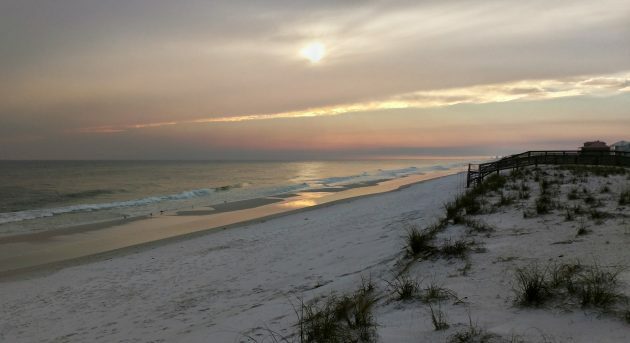 From his time hunting, Brian knew where rafts usually sheltered from the wind on the Santa Rosa Sound, and we strolled down the shore towards the black dots in the distance. 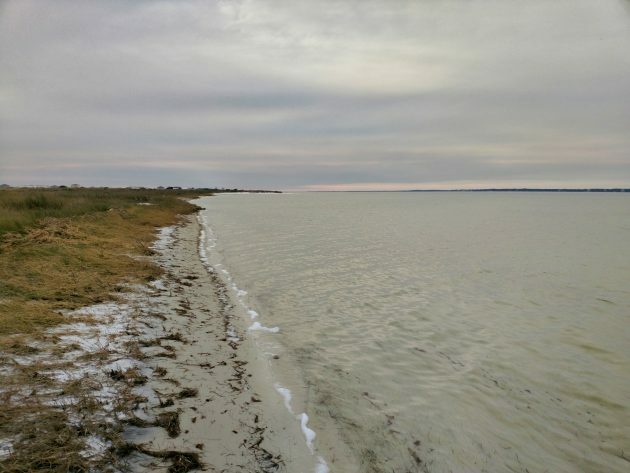 View of the Santa Rosa Sound shoreline. Binoculars turned towards the water, I spotted Common Loons, Horned Grebes, and Bufflehead as we walked, Brown Pelicans, a juvenile Bald Eagle, and Ring-billed Gulls soaring past us overhead. In Northwest Florida, this is the most active time of year for our estuaries and bays – during spring, summer, and fall, waves are rarely graced by species other than Double-crested Cormorants. Excitement gathered in my chest as we approached the first clump of birds: Redheads! Hundreds of them, their gorgeous plumage visible even in the waning light of the afternoon. A few Lesser Scaups mixed in as well, adding another tick to my year list. I’ve had a slow birding start to 2019, but Gulf Islands National Seashore added nearly a dozen new varieties to my annual count, inspiring me to delegate more time to birding in the near future!